Recently, on a chilly, rainy Sunday afternoon, my husband and I decided to watch a movie. Although we could have picked a recent box office hit by going through our cable company, we decided to forego spending any money. As we perused the free movie titles, we came across an old favorite. We settled down in our cozy leather recliners and clicked play on the remote. The movie began and we became engrossed in it. Even though we'd both watched the movie many times before, we enjoyed picking up little details we'd missed in the scenes or the script. As the movie neared the end, one of the movie lines hit me right between the eyes. In 1994, the movie drama, The Shawshank Redemption, came out. It was basely loosely on the Stephen King novella, Rita Hayworth and Shawshank Redemption. 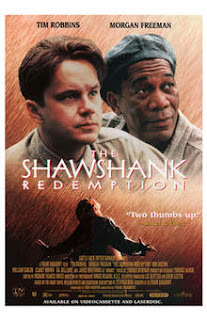 The movie revolves around two main characters, Ellis Boyd "Red" Redding, played by Morgan Freeman, and Andy DuFresne, played by actor Tim Robbins. Through a series of unlikely events, these two men become jailhouse friends. After being turned down for parole on many occasions, Red has resigned himself to the fact that he'll spend the rest of his life in prison. Andy, on the other hand, maintains his innocence and begins to secretly plot his way to freedom. As their friendship grows throughout the movie, Andy and Red have some very deep conversations about life. Now that I've given you some background, I'll get back to the scene that touched me deeply. Sitting outside a wall, in the recreation yard, Andy and Red are talking. Andy begins sharing his dreams of life outside the prison walls. With a dreamy look in his eyes, Andy opens his heart to Red. He tells Red he wants to go to a city in Mexico and run a small hotel. He wants to buy an old boat and fix it up. He doesn't want much, just an opportunity to live freely. Red listens and then squashes Andy's dream when he says something like this, "But you're in here and that's out there." Andy immediately stops talking but before he closes himself off completely from the conversation, he makes a profound statement, "I guess it comes down to a simple choice, really. Get busy living or get busy dying." WOW! I felt like someone hit me between the eyes with a two by four. Andy's movie line kept running through my mind and I couldn't help but fixate upon it. "...Get busy living or get busy dying." Those were simple words but held a powerful message. The more I thought about it, the more I knew I'd make those 7 words my new motto for the rest of my life. For the past 22 months, I've been existing somewhere in between living and dying. I haven't committed to either one. Andy's statement to Red resounded in my mind, ""I guess it comes down to a simple choice, really. Get busy living or get busy dying." It was simple. It was a choice. I needed to decide if I was going to keep on letting breast cancer have place in my life or if I was just going to kick it to the curb and get on with my life. I'm ashamed to admit for far too long I've let breast cancer have control. Every once in a while, I've even found myself still saying I have cancer! I've also conveniently allowed it to be an excuse when I didn't feel like doing something. I hadn't been really living, oh no, I was teetering on the edge of life and death. That type of behavior is probably typical of most breast cancer survivors. We go through a traumatic, life changing experience and then can't figure out how to muddle through getting our lives back. It's complicated and we don't always have help figuring it out. Making a decision to start living isn't as easy as you'd think. Before you judge me, let me explain without sounding like I'm making excuses. Breast cancer has affected my life in big ways. Not only has it affected me physically, it's affected me emotionally. I no longer have the physical strength or stamina I once I had. I can't look in the mirror at myself without crying. My self esteem has suffered greatly. My confidence has dwindled to practically nothing. I do my best to get through one day at a time, but it's really hard. I try to stay active and busy but some days, I just can't do it. When things get difficult, I make myself push through but I don't feel like I'm really living...at least not in the way I lived before I was diagnosed with cancer. "Get busy living or get busy dying." I'm not ready to give up and die so that option is definitely out (as long as I have a choice about it) so the only option left is to get busy living. Even though I suffer chronic insomnia, Lymphedema, severe upper back pain, and extreme fatigue, I want to live and live well. I don't want to exist somewhere in between. "Get busy living or get busy dying." Those words were practically magnified when I first heard them. It was as if I'd received a telegram from Heaven or something...a message meant especially for me. I guess you could say I received a little enlightenment that day. Warning, here comes a spoiler alert so if you haven't seen the movie, stop reading here. Andy manages to escape from prison. He ingeniously figures out a way to fulfill his dream of going to Mexico, open a hotel, buy a boat to fix up, and live comfortably on someone else's money. His lackadaisical attitude about life while imprisoned is a thing of the past. No one had a clue that he'd been plotting and planning the entire time he was held captive. I guess what I'm trying to say is when you finally do decide to start living again, it's simple decision. Once you make the decision, you have to just decide to be all in and go for it full throttle. So there will be no more teetering between life and death for me, no sirree! It's time to get busy living and that's exactly what I'm going to do starting right now. Sure, I'll still have the bodily aches and pains. I'll still struggle with fatigue and other maladies, but my attitude has changed. Instead of feeling defeated all the time, I have hope. I can rise above. I can and will not only survive but thrive. I choose to get busy living. Thanks, Andy! One of my favourite movies! Love it! After reading this I'm going to have watch it this week!